It is both a venerated tradition and a running club cliché to dream of running the marathon in under three hours. And now, just as almost every other amateur marathoner around, I too had been embrangled in the hype; I’d been led to aspire to the sub-three-hour marathon. Since beginning my running “career” in late 2016, I’d managed to break 20 minutes for the 5 km, then 40 minutes for the 10 km, and then 19 and 39 minutes for the same distances. And as the PBs kept rolling in, so the daydreams amplified. Towards the end of 2017, I was ready to the attempt those 42 odd kilometres. I made my first attempt in January, travelling south from Sydney to Hobart for the Cadbury Marathon. The plan was to run at 4.15 min/km pace from start to finish—in just enough time to bring me home under 3 hours (2.59.20). Alas, at the 30 km mark, I lamented as the pace slipped from under me, with the reading on my GPS watch falling from 4.15 min/km to 4.16 min/km and then, in the last 5 km, to 4.18 min/km. And yet, having brought it home in 3.02.04, I smiled through exhausted tears. I was happy. It was quite a bit faster than I’d imagined I’d run. Cadbury Marathon. Looking slightly irritable. After Hobart, I quickly returned to my regimen of 30 km Sunday runs, not wanting to lose any “marathon fitness.” It was not until April, however, that things really began to click into place. In mid-April, I ran a personal best of 84 minutes flat at the Canberra Running Festival half marathon, indicating I’d been doing something right before then. What I had been doing was running just over 90 km per week through March, with most weeks including a 30 km long run on Sunday, and the final weeks including a longer interval-based run on Wednesday (see below). 90 km weeks through March and April. The week beginning 9 April (with a 67.8 km week) is the taper week before Canberra half marathon. With Canberra done, my focus immediately turned to the Gold Coast Marathon, and in the week immediately following Canberra, I jumped up to a 98 km week. In the three weeks that followed, I hit just over 100 km, which took me through to mid-May with a new goal baseline: 100+ kms per week. 100 km+ weeks through April and May. From mid-May onward, I began to hit bigger mileage numbers, running an average of 118 kms per week in June (see below). Before then, I had never run more than 102 km in a single week. Mercifully, the higher load seemed only to reinforce my muscular (contractile) strength, and I remember marveling through this period at how strong my legs felt—much stronger than they had felt when I was running only 90 kms a week in earlier months. That, I suppose, is precisely the aim and effect of accumulative training. 110–120 km weeks through May and June, with Bay to Bay half marathon on 17 June. On 17 June, I ran another test race: namely, the Bay to Bay half marathon. Beginning in Woy Woy, this flat-but-undulating course ends in Gosford’s Central Coast Stadium. Clearly the bigger mileage was taking effect by this time, as although I didn’t intend to run a PB for this race (with only a few weeks until the marathon itself), I came through at 83.11 (3.56 min/km) for a 45 second PB. Bay to Bay at 3.56 min/kms. Gasping. During this training block, I was not running any weekday “doubles,” so I tried to fit more miles into my single daily runs wherever possible. This involved getting out earlier for warm ups, and ensuring I got the most out of my Wednesday med.-long run, always hitting between 20 or 25 kms. I did manage to fit in a double on most Sundays in June, though, running a gentle “recovery” run in the afternoon after my 30 km run in the morning, usually around the hilly Balls Head Reserve. I like to think that placing this additional load on the legs after the 30 kms in the morning was beneficial for those later stages of the marathon. With bigger mileage on the Wednesday and Sunday, the basic shape of my regular training week began to mirror what is often known as the “classic Australian program.” If you listen to the Inside Running podcast (and I urge you to do so), you’ll probably have heard sub-2.20 marathoners Julian Spence and Bradley Croker refer to this weekly schedule in its various incarnations. The basic idea is that one runs two or three “sessions” per week, usually on a Tuesday, Thursday, and/or Saturday. These are speedwork bouts that aim to quickly get the body accustomed to, among other things, increased levels of anaerobic stress (lactate production) and oxygen-deficient states. For my speedwork sessions, I would run a fartlek or interval session on Tuesday—usually a Mona fartlek, or similar; then, on Thursdays, a 6 km tempo run with some hills thrown in on the Kirriblli Runners “Classic KR” run; and a tempo run at a parkrun (usually Mosman or Willoughby) on the Saturday, having warmed up over some 7 kms of hills beforehand. In the final weeks before Gold Coast Marathon, I began running two parkruns on the Saturday—Mosman (7 a.m.) and then North Sydney (8 a.m.)—which, although it only gave me the same total of 20 kms for the Saturday, now included two 5 km tempo efforts at roughly 3.50 min/km. As far as I know, the classic Australian program offers no strict diktat about what’s to be done on the Monday. From what I gather, though, Mondays are meant to be for steady recovery runs without too much exertion. On my Mondays, I ran primarily to keep the aerobic fitness stable and steady. I would do Monday night run with Kirribilli Runners, running the #KR10K course, which includes a few hills over the last kilometres. As the weeks progressed, I’d also run a warm up of about 4–7 kms (5.00 min/km) before running the actual workout at about 4.30 min/km. Though non-prescriptive on the Monday, the classic Australian program is unambiguous about a medium-long run on the Wednesday. The aim of this midweek element is to improve overall endurance and to enhance energy metabolism (or metabolisation), similarly but differently to the Sunday long run. On reflection, I think the Wednesday medium-long runs were my most useful sessions. I would typically run a 4 km warm up from Kirribilli to St Mary’s Cathedral (Sydney), and then run 3 km bouts up and down Art Gallery Road at my half-marathon pace (at about 3.57 min/km), with a 1 km recovery run between each effort at 4.45 min/km. I would then run a 4 km warm down back to Kirribilli, but I’d always try and pick up the pace towards the end, for a total of some 20+ kms. An alternative to this session that I ran earlier in the training block comprised a 15 minute warm up, and then 3 or 4 bouts of 10 minute tempo running at half-marathon pace of 3.57 min/km, with 5 minutes of recovery running (at 4.45 min/km) between the bouts, followed by a fifteen-minute cool down. In this version, I would run for about 90 minutes, and usually get up to about 20 kms. Of course, in the classic Australian program, one also runs a long run on the Sunday. Generally, most everyone thinks of the Sunday long run as the most important run of all. There are many excellent books that sing praise to the long run. An oldie but goody is Jack Daniels, Robert Fitts, and George Sheehan’s Conditioning for Distance Running (1978); another, which I love for the radicality of its mileage regime, is Arthur Lydiard and Garth Gilmour’s Running with Lydiard (2nd rev. ed., 2017), in which Lydiard’s runners are said to run 200 kilometres per week, not including “junk runs.” The classic that every runner seems to read and recommend is Pete Pfitzinger and Scott Douglas’ Advanced Marathoning (2001); and while I found this book very useful in parts, it was something of a dull read overall. And for those more inclined to seeking out the detailed physiological explanations for distance running’s effects, I’d recommend looking at Marathon Running: Physiology, Psychology, Nutrition and Training Aspects (2016), edited by Christoph Zinner and Billy Sperlich. My long runs were 30 kms, initially at 4.30 min/km, then 4.20 min/km, and then, with a few weeks to go, I ran a great 30 km run around Centennial Park (8 laps) with my training partner Clint; we were paced by 2.44-marathoner Simon at about 4.03 min/km. As the fastest 30 km I’d ever run, this was a huge confidence booster before the big race. It was some 5–7 seconds faster than my goal race pace. I flew up from Sydney the day before the race, leaving on a 12.30 p.m. flight. After a relaxed parkrun (at 4.30 min/km) in North Sydney, I got myself ready and caught a 9.45 a.m. train to the airport with my friend Adam (running the half) to get there ahead of our midday flight. One of the big logistical hiccups in the lead-up to this race actually came into effect while we were still in the air. When we hit the tarmac at Gold Coast Airport, I switched on my phone to discover I’d received an email from Bookings.com. The email notified me that, since my credit card had been declined, I now had only 2 hours to update my details before my room booking was cancelled. (I had lost and replaced my credit card about five weeks earlier, after I’d booked the hotel.) Fine, I thought, and I updated my details right away. The email was only some 15 minutes old. However, it was then that I noticed I’d also received a text message from the hotel I had booked well in advance. To my surprise, it stated that my booking had been cancelled. The next 2 hours were a stressful mess—any sense of calm was now long gone. Eventually, however, the hotel found me another room. “Don’t you know the Gold Coast Marathon’s on?” the manager asked. I held my tongue. Another stressful issue I faced in the days leading to the marathon, and up to morning of the race, were those dreaded “gastro-intestinal issues.” Suffice to say I was probably stressed for the race, and this made my stomach very moody. Even after dinner on the night before the big day, these issues had still not resolved. I won’t disclose in this forum what measures I took to resolve these issues, but I will say that nothing quite worked completely. And on the morning of the race, I still felt very bloated, anxious that I’d have to run a full marathon on a full stomach. Thankfully, with only about 15 minutes before the gun, I was able to get myself in a position to feel a lot better. Getting there involved three cups of coffee—two cups of instant at the hotel, and a ristretto from a cafe near the start line. Of course, this also meant that I went into the race in a hyperactive state, and was already overheating and shaking by the time I put my race shoes on in the Gold Coast’s 99% humidity. I knew I’d probably feel some fade from the caffeine metabolisation during the race (even though caffeine, as I learnt, hangs around in the system for more than 5 hours), but I persuaded myself I’d have enough caffeine in my cherry Clif Bloks (50 mg caffeine) to top myself up and get me through. Now ready to go, I jogged to the start line. Once there, I heard someone calling my name. It was my friend Alana. A talented runner making her marathon debut, Alana had also been the official 85 minute pacer at Canberra when I ran the 84 flat. During that race, I’d spent the first 16 kms at her shoulder. Impressively, Alana had a preferred entry (her half PB is 80 minutes! ), so I jumped over the fence into the preferred runners’ lane to run a mile with her at about 4.30 min/km pace and to share our feelings about the race. Before long, we said our goodbyes and good lucks, and set about preparing ourselves for the gun. I jumped the fence, moved into the “A” corral, and found myself at the side of my training partner, Clint. Despite having to begin his taper early after falling quite seriously ill a month before the race, Clint had miraculously persevered, managing to make it to the start line. We were both looking for around 2.56. Just behind me was another friend, someone I’d known from my undergraduate days, Matt; he’d been running very well in the lead-up to the race, and he too was also looking for a sub-three. Just before the gun, I’d chatted with Clint and Matt about the first kms, and we’d all agreed it’d be a good idea to run a conservative first 5 km. This, I suggested, could mean sticking with the 3 hour pacer for the first 20 mins. Clint nodded. “That’s what I’ll be doing,” he said, assuredly. But that was never going to happen, was it? Once the gun went off, I watched as Clint, Matt, and four Sydney Striders—Jacko, Andrew, Patrick, and Charl, all aiming for about 2.55.00—went out at about 4.05 min/km pace. Reluctantly, I hung with them for the first 3 kms. As they always do, these first kms went by just as easily as the breeze. At about the 4 km mark, however, I let this group get away. After all, for my goal of 2.56.00, all I needed was 4.10 min/kms! The first 10 kms felt very controlled and comfortable, and I picked up a few guys along the way, some of them going for a sub-three. I found myself running at the front of a pack, which suited me. While I don’t mind running side-by-side other runners, I tend to feel slightly claustrophobic and panicked about footing when I’m right on someone’s shoulder. Over the first 10 kms, I wasn’t too worried about splits; after all, I didn’t have any split notifications coming through on my watch. As I usually do in races, I had just set my watch to display the average pace, and was, from the start, very conscious that I was running faster than I’d planned: that is, at about 4.06 min/km. And although I felt comfortable and very much like I was running “inside myself”— i.e., that I was holding back—I must have been a little paranoid about getting carried away, because I pulled back the pace in the second 5 kms, and ran at 4.09 min/km pace. About 200 or 300 metres in. Clint, who is already pulling away, can be seen just out of shot in the red singlet on the right. The next 10 kms were just as comfortable as the first. I just tried to enjoy the run as much as possible, and to feed off the crowd’s enthusiasm. There was a turnaround point at about 16 kms, which helped put things in perspective. Jacko and the other Striders weren’t far ahead, I noticed; and Alana, ever the pacer, kindly called out my name in support. Clint seemed to have sailed ahead of all of us. I remember feeling quite good, if not a little impatient, as I came up to the half marathon mark. When I passed over the mat and looked at the clock, it read 1.27.16. Perfect, I thought. I was glad I hadn’t run any faster, as the rough plan had been to come through this point at 1.27.30. Getting from the 21st to 30th km seemed to be a pretty relaxed affair too—although I did begin to fatigue from about the 26 km mark and onward (especially if the photos are anything to go by). Nonetheless, I had, from 24 kms and on, begun to regularly pass people—and very few seemed to be getting past me. At about the 26 km mark—just as we passed Cavill Avenue on the way back to the start line—I found myself running with a woman who had evidently travelled from China to run the marathon: as we passed through the crowds, some of her supporters, cheering her on in Mandarin, adopted a very serious, even scolding tone. These cheers—which I took to be a form of negative self-talk—were actually a real boost for me, as I vicariously fed off the same strict obloquy intended for my offsider. And although I was able to stay with her for about a kilometre, she slowly edged away and was ahead of me by the 30 km mark. She was one of the handful who overtook me in that 25–35 km stretch. 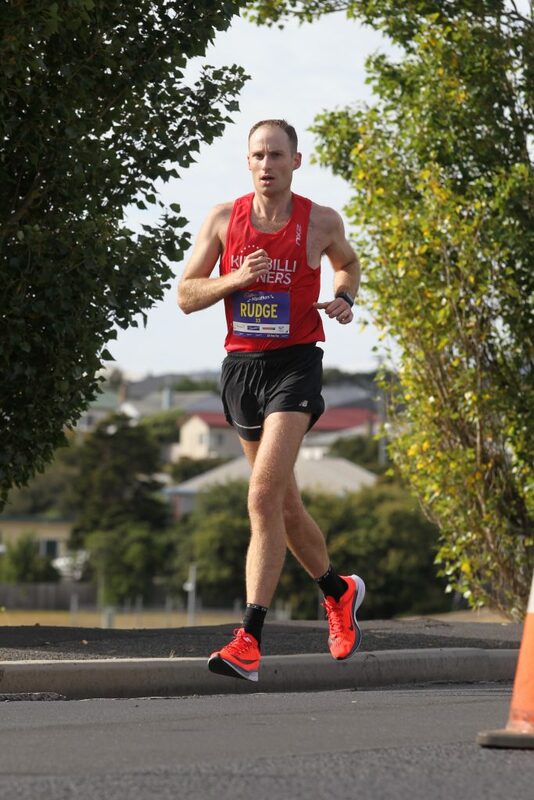 Another was Sean Bowes, a running coach in Sydney (in the first few kilometres of the race, Sean had told me he was having an “easy day”—and he was; after all, he’s a sub-2.30 marathoner). Sean passed me a little later on, probably at around the 32 km mark. You can just make him out in the background of the photos below; he’s the second runner behind me and my offsider, wearing all black. Not quite ready for my close-up. Looking a little tired at this point. It was from about 32 kms and onward that things became more interesting. Around that point, I began passing a few runners I knew. First there was one, then another, then one of the Striders guys, then another, until by around 35 kms, I’d passed almost all of my “rivals.” I was yet to see my training partner Clint; but, by that stage, I had long forgotten about catching him, and was focused simply on keeping my average pace to as close to 4.07 min/km as possible. Despite taking over a bunch of runners, my pace was dropping. I think by this time it was wavering between 4.07 and 4.08 min/km. I certainly did not want to see 4.09 appear on the watch—not before I hit the 39 or 40 km mark anyway. When I look at the 5 km splits now, I notice that the 35–40 km section was quite a bit slower than the rest, and it was in this section that I dropped off my goal pace of 4.10 min/km to sit at a 4.13 min/km average. 30–35 km. The first sub-21 fail at 21.05. From 35 to 38 kms was a tough stretch. At the turnaround, at about 36.5 km, I found myself on the tail of another Strider, which helped keep me engaged in the race. It turned out that the 35–40 km stretch was my slowest 5 kms at 21.39 minutes. Through these kms, My average pace dropped to 4.19 and, for the first time in the race, I slackened to an average speed of less than 14 km/hr. Ready for it to be over. Although my pace had dropped between 35 and 40 kms, it would only get worse for the 40th and 41st. By that stage of the race, I was just holding on. Although I’d slowed to 4.19 min/km pace, I was still passing people, including my training partner Clint! As I passed by, Clint grunted encouragingly. He was clearly slowing (after all, I was slowing too), but he seemed to be good to make it home for a sub-3. On kilometre 41, I tried to pick up the speed, running the home stretch with renewed vigour. I distinctly remember counting down the distance in 50 metre increments: 900, 850, 800, 750, and so on. Without about 600 m to go, I really switched on psychologically, and pelted myself through the chute. As we turned the corner into the home stretch, I spotted two bodies ahead of me. I ran hard to take them over in the last 400m, coming through as fast as I possibly could. I knew I was on for something like 2.56, but I had no idea where I’d be within that minute range. I looked up at the clock. I was coming over the mat in 2.56.26—gun time! I’d finally done it! Elated, I slowed to a halt, and suddenly felt a sharp pang of pain rising from the bottom of my calf. It was a cramp. I stretched out the legs and cradled the cool metal fence. It was the kind of cramp I’d felt only once before—at the end of Hobart marathon. “Are you alright?” a medic enquired, concerned. “I’ll be fine,” I said, beaming, before congratulating the others now coming through the finish. It would be just another 45 seconds before my training partner Clint crossed the mat. He’d broken three hours comfortably. It was a great moment. As we went through the motions, collecting our medals, eating bananas, and—finally—sitting down to rest, we could hardly stop our grinning. The moment we’d been training for.